Nintendo's Wii U was hardly the focus of E3 2013 this week, but the Mario developer presented a decent showing of news games anyway. During a Nintendo Direct video that aired simultaneously worldwide on Tuesday, the company debuted new Mario and Mario Kart games and showed footage from the next Super Smash Bros. and Pikmin titles. The gorgeous-looking Legend of Zelda: Wind Waker HD appeared as well, plus numerous third-party games, most of which will also appear on other consoles. TechRadar got the chance to play some of the new titles at E3 this week, and while we're always down to game, we came away with mixed feelings. Despite the new Nintendo hardware that launched late last year, the company seems to be stuck using the gimmicks of the past all too often. At Nintendo's sprawling E3 booth we played the newly announced Mario Kart 8 and Super Mario 3D World, as well as Mario & Sonic at the Sochi 2014 Olympic Winter Games, Wind Waker HD and the long-awaited Pikmin 3. Each of these games uses the Wii U hardware in unique ways, but they all rely on old gimmicks as well, particularly when the seven-year-old Wii Remote is involved. Mario Kart minus gravity. What's not to like? Some of these functions, like the ability to pull the image from the TV down to the GamePad's screen in Mario Kart 8, Super Mario 3D World and Wind Waker, are as welcome as ever. In fact, the GamePad continues to prove useful in subtle ways. In Mario Kart, you can switch control methods (analog stick or tilt steering) with a quick tap, no pausing necessary. There's a map there too, and the same is true in Pikmin 3. In the Wind Waker remake, the GamePad can alternately show a map, the player's inventory (with super convenient drag-and-drop equips) and a new, largely unexplained messaging feature called Tingle Bottles. Mario World takes things further still by allowing the player with the GamePad to manipulate objects and enemies in-game using the touch screen. None of these features totally justify the GamePad as the must-have device that Nintendo wants it to be, but they do add something to each experience. Things start to get iffy when the old Wii Remote is involved. Nintendo's original motion controller was good at many things, but never really great. Whether you're using it to point at the screen in Pikmin 3 or attempt to steer a snowboarding Sonic the Hedgehog down a mountain, it just feels dated. Some Pikmin 3 players may prefer the point controls, but luckily the option to use the GamePad or even the Wii U's Pro Controller will ultimately be present as well. These options weren't present during the E3 demo though. The Mario & Sonic title is a different story. 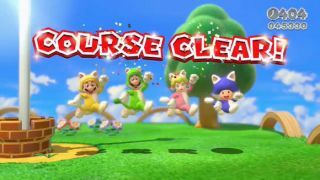 Like the other games in the series, this latest uses the Wii Remotes heavily for their motion control capabilities. In a competitive snowboarding race you hold the controller horizontally and tilt it to steer; in a cooperative bobsled race, you hold the Wii Remote vertically and tilt it to steer. This is a gimmick we've been seeing for years and it's as imprecise now as it ever was. And like other Wii U games, this one commits the unfortunate sin of displaying a real-time feed of the GamePad player's face (thanks to the device's front-facing camera) on the TV for everyone to see. That angle is never flattering. There was plenty good at Nintendo's E3 booth. Pikmin 3 looks great, and it gets bonus points for still including split screen - though online play isn't looking likely. That stubborn refusal to embrace the modern age has worked against Nintendo in the past, though given recent developments in the saga of the Xbox One, gamers may suddenly start to feel a lot happier to have a console that doesn't need to be online all the time. Super Mario 3D World plays fantastic, much like its cousin on 3DS, Super Mario 3D Land, but with chaotic multiplayer as well. The cat suit feels different from past power-ups, but not in a bad way. And Mario Kart 8 is Mario Kart, but with anti-grav motorcycles. It's hard to go wrong with that. But is it still too little, too late? Where's that new Zelda game? It's great to see Super Smash Bros. and more Donkey Kong Country, which Nintendo also showed off this week, but what about Metroid, Star Fox and Nintendo's many other infrequently seen first-party gems? Nintendo has always struggled to juggle everything its myriad fans want to see, and this year is no exception. Hopefully, it all proves enough.